The Extraordinary Eighteenth-Century Account of Father Ippolito Desideri S. J. 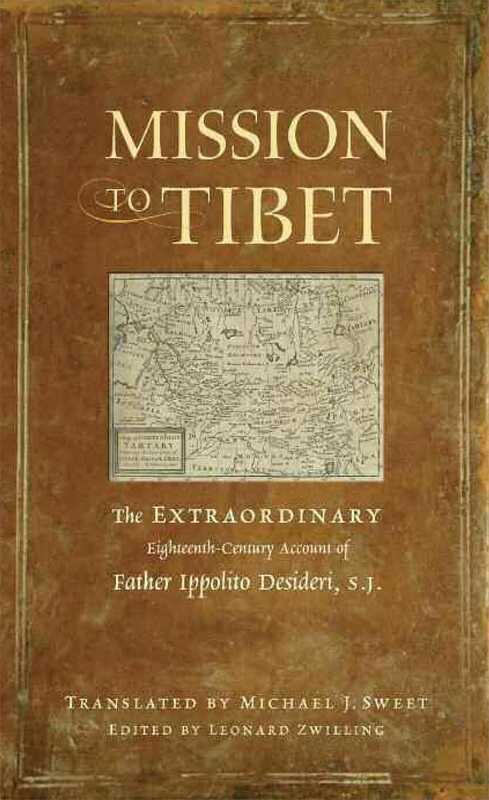 Mission to Tibet recounts the fascinating eighteenth-century journey of the Jesuit priest ippolito Desideri (1684 - 1733) to the Tibetan plateau. The italian missionary was most notably the first european to learn about Buddhism directly with Tibetan schol ars and monks - and from a profound study of its primary texts. while there, Desideri was an eyewitness to some of the most tumultuous events in Tibet's history, of which he left us a vivid and dramatic account. Desideri explores key Buddhist concepts including emptiness and rebirth, together with their philosophical and ethical implications, with startling detail and sophistication. This book also includes an introduction situating the work in the context of Desideri's life and the intellectual and religious milieu of eighteenth-century Catholicism. "Michael J. Sweet and Leonard Zwilling should be commended for their splendid presentation of the text, their edition and translation, their abundant notes, and their outstanding introduction to Desideri and his book." "Written in a fluent, readable style. For English speakers, Mission to Tibet will be the benchmark." "The combination of Sweet's assured translation and Zwilling's attentive editing make a solid contribution to Tibetan studies, Jesuit missionizing, and early European travel reports from Asia, and provide crucial evidence for the importance of this pioneering scholar-priest." "Of all the Roman Catholic missionaries to Asia, the Italian Jesuit Ippolito Desideri (1684-1733) was perhaps the most remarkable. Despite his fervent hope of converting Tibet to the Christian faith, he was in important ways the first Western scholar of Tibetan Buddhism, translating Buddhist texts into Italian and writing scholarly tomes in Tibetan, complete with quotations from Nagarjuna. Mission to Tibet offers the first complete English translation of Desideri's captivating account of his sojourn in Tibet." "As this accomplished translation by Michael J. Sweet, edited by Leonard Zwilling, demonstrates, Desideri was more than merely a determined and subtle opponent of a religion not his own; he was also a perceptive scholar of Tibetan doctrine, an amazing linguist, and a fascinating travel writer. Sweet has captured his essence in this commanding work. Everyone with an interest in Tibet, Tibetan Buddhism, world history, and world religion will enjoy this wonder-filled account of Desideri's pioneering adventure, intimately detailed from Rome to Lhasa and back." "Mission to Tibet is the most important work to appear in the field of Desideri studies since Luciano Petech's critical edition of the Jesuit's writings over fifty years ago. That Mission to Tibet provides a rip-roaring adventure, political intrigue, and a window onto a long-lost Tibet only adds to the pleasure of reading this new translation." "Sweet's and Zwilling's thorough historical work and beautiful translation make this book an instant classic and essential resource for anyone interested in the history of intercultural learning, comparative theology, and missiology."